Dr. Yoon teaches both clinical and didactic nursing courses for undergraduate and accelerated BSN students. In addition, Dr. Yoon mentors and supervises Honors students, McNair Scholars, and doctoral students (both PhD and DNP). Dr. Yoon’s research areas are under the umbrella of palliative care, oncology, symptom management, and complementary therapies. Dr. Yoon focuses on symptom management of adult cancer populations, with particular interest in managing symptoms and/or symptom clusters using complementary therapies as the interventions to improve patient outcomes and quality of life after treatment. She is currently conducting a pilot study (randomized controlled trial) to investigate the effect of acupuncture on managing cancer-related anorexia and cachexia in patients with GI cancer. The study has been funded by the UF Opportunity Seed Fund and partially supported by the Clinical Translational Science Institute (CTSI). Another ongoing study is examining the Progression of Weight Loss in Patients with Gastrointestinal Cancer with the existing data obtained via i2b2. She completed studies on the use of dietary supplements to manage chronic pain, the effectiveness of CAM for chronic GI symptom management, and a feasibility study to improve appetite and slow weight loss among adults with cancers of the GI tract. Other areas of interest include symptom management of chronic conditions such as sickle cell disease, irritable bowel syndrome and ovarian cancer. 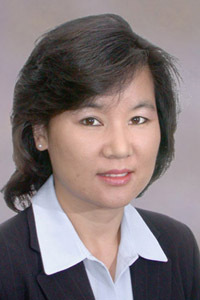 Dr. Yoon is a member of the Academic Affairs Committee (AAC) and the Nursing Formal Review Committee (NFRC). She is a member of the American Society of Clinical Oncology (ASCO), Oncology Nursing Society (ONS), Sigma Theta Tau International Honor Society (STTI), Southern Nursing Research Society (SNRS), American Nurses Association/ Florida Nurses Association (ANA/FNA) and UF Health Cancer Center (UFHCC). She has been the recipient of many honors, most recently the UFHCC Celebration of Excellence Award (Bench to Bedside Award) and the UF Research Foundation (UFRF) Professorship Award. Since 2004, she has been serving as a reviewer for various journals. Dr. Yoon received her BSN in Nursing at Seoul National University (Korea). She received her MSN in Adult Health Nursing and her PhD in Nursing at the University of Florida, Gainesville FL. Horgas, A. L., Grall, M., & Yoon, S. L (2016). Pain management. In M. Boltz, E. Capezuti, T. Fulmer, & D. Zwicker (Eds. ), Evidence-Based Geriatric Nursing Protocols for Best Practice (5th ed., pp. 263-281). New York: Springer. Kelly, D., Lyon, D., Yoon, S. L., & Horgas, A. (2015). The microbiome and cancer symptoms:Implications for oncology nursing science. Cancer Nursing. [Epub ahead of print] PMID: 26110573. Grundmann, O., Yoon, S. L., & Williams, J. J. (2015). The value of bioelectrical impedance analysis and phase angle in the evaluation of malnutrition and quality of life in cancer patients – A comprehensive review. European Journal of Clinical Nutrition. 69, 1290-1297.doi: 10.1038/ejcn.2015.126. PMID: 26220573. Park, C. S-Y, Yoon, S. L., Hamilton, C., & Cook, C. (2015). A Brief research report on understanding the meaning of driving for older Americans: A Korean’s perspective on two cultures. Cross-Cultural Communication, 11 (7), 1-10. doi: 10.3968/7234. Yoon, S. L., Grundmann, O., Williams, J.J., Carriere, G., & Gordan, L. (2014). Cancer-associated anorexia and cachexia in adults with GI tract cancer: Novel intervention with acupuncture [Abstract]. Oncology Nursing Forum, 41(2), E81. Grundmann, O., & Yoon, S. L. (2013). Mind-body therapies for functional bowel disorders – A review of recent clinical trials. European Journal of Integrative Medicine, 5 (4), 296-307. Yoon, S. L., & Kim, J. H. (2013). Job-related stress and emotional labor with depressive symptoms among Korean nurses. Journal of Nursing Scholarship, 45 (2), 1-8. Yoon, S. L., Moshiree, B., & Grundmann, O. (2011). Recent developments in the use of pre- and probiotics for irritable bowel syndrome. European Gastroenterology & Hepatology Review, 7 (4). 237-241. Shuster, J., Anton, S., Theriaque, D., & Yoon, S. L. (2011). Control in the middle (CIM) for three-arm crossover studies. Planta Medica, 77, 1473-1476. PMID: 21509714. PMCID: PMC3296130. Yoon, S. L., & Schaffer, S. D. (2006). Herbal, prescribed, and over the counter drug use in older women: Prevalence of drug interactions. Geriatric Nursing, 27, 118-129. Yoon, S. L. (2006). Racial/ethnic differences in self-reported health problems and herbal use among older women. Journal of the National Medical Association, 98, 918-925.